Advocacy is broken down into 5 branches. Monitor legislation relating to the practice of school psychology and other issues pertaining to education and school based mental health services both locally and nationally. Advocate for the passage of legislation pertaining to the annually established legislative priorities of the association both locally and nationally. 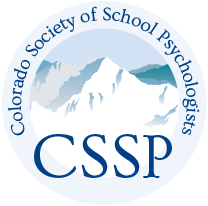 Inform CSSP members of legislative initiatives and laws that relate to the practice of school psychology both locally and nationally. Coordination with the newsletter editor for timely publication of legislative news. Review Bill Status Summary sheet and identify possible bills of interest to the membership via report to the board and executive council. health care – related meetings as a representative of CSSP’s position on topics of interest. Recruit CSSP members to serve on the CSSP S-W CRT ineither a Tier I or Tier II capacity, as outlined in the team’s membership and guidelines. Coordinate communication to the membership regarding the CSSP S-W CRT priorities, actions plans in which the membership can participate to further the crisis management/prevention/education interests of the organization. Coordination with the newsletter editor for timely publication of crisis teams news. Coordination and planning with the Conference Chair for a crisis team table at conference. If possible, submit a Call for Presentation/Paper for the annual CSSP Conference on a topic related to the field of crisis intervention and prevention. Maintain contact with NASP, NOVA, NEAT, COVA, ISPA and other agencies related to crisis intervention and prevention. Maintain criteria for team membership (Tier I and Tier II), reviewing responsibilities with members annually. Facilitate and coordinate Direct Crisis Response: Upon request from a school administrator, CSSP Statewide Crisis Response Team members may be dispatched to local school districts to assist in direct crisis response. Facilitate communication between CSSP and others for the purpose of sharing common issues, interest, or concerns. Make timely reports to their program area regarding matters of concern to the organization. Make a listing of representatives from each of the above organizations and turn it in to the Technology chairperson and/or webmaster for creation of a listserv. Make announcements, elicit feedback and receive pertinent information to distribute through the listserv. If attending ISPA, participate in the ISPA state delegate representative meeting. Promote cultural awareness and culturally competent practices in the field of school psychology. Reach out to various cultural and diverse groups such as Native American, African American, Asian American, Latino, and GLBTIQ (Gay, Lesbian, Bisexual, Transgender, Questioning, or Intersex) students and to obtain information about the specific culture and values to apply to best practices in school psychology. Submit articles to the CSSP newsletter a minimum of two times per year. These articles will focus on improving the cultural competencies of school mental health providers. Disseminate relevant information and professional development opportunities surrounding working and collaborating with multicultural/multilingual populations. Advocate for and assist with the selection of CSSP conference presentations, workshops, and meetings. The representative(s) for the Committee will regularly attend CSSP board meetings and engage in board-related responsibilities.